Much ink has been spilled to figure out the root causes of recent xenophobic attacks in South Africa. Some have blamed it on the ruling African National Congress (ANC)’s government inability to deal with high crime, poverty, and unemployment rates, while others, including Garikai Chengu are pointing the finger at Apartheid legacy. In his recent article, titled “Xenophobia In South Africa: Driven By Apartheid Legacy Of White Monopoly Capitalism”, Mr. Chengu, a scholar at Harvard University, blames white capitalists. Whites comprise only 12 percent of the population. Thanks to the past 350 years of racist exploitation, Whites owned 87 percent of agricultural land by Independence Day, 1994. During these twenty-one post-colonial years, precious little has changed. One exception is that Black people in rural areas have lost 600,000 jobs since Independence. This has created a great wave of migration into urban townships. Lyn Foxcroft, a business consultant who studied wine consumption among emerging consumers in South Africa, writes, “Of the 8.3 million adults classified as middle class in 2012, 51% are black, 34% white…. This is a dramatic shift from the 2004 proportions: white 52%, black 32%” South Africa’s middle class generally spends a whopping $40 billion annually. Its 4.2 million black middle-class citizens represent a chunk of this amount, with nearly half having a post-secondary degree and more than 50% of families sending their children to private schools. Finance minister Pravin Gordhan adds that generally since 1994, per capita national income is up 40%, while up to four in five people are now connected to the electric power grid. Welfare dependency, a problem across the developed world, has reached a danger level in South Africa. More people receive aid than have jobs, and the ratio has been worsening for five years. While the handouts have helped address abject poverty since the end of the apartheid regime, they haven’t helped recipients get skills needed for jobs in a country with 24 percent unemployment. Due to economic problems stemming from the sovereign debt crisis in the EU (its largest trade partner), the South African economy is still in a doldrum. Instead of implementing structural reforms to open up the labor sector, and diversify the country’s trade partners by signing a FTA with China, for example, Zuma and the ANC have increased government spending. 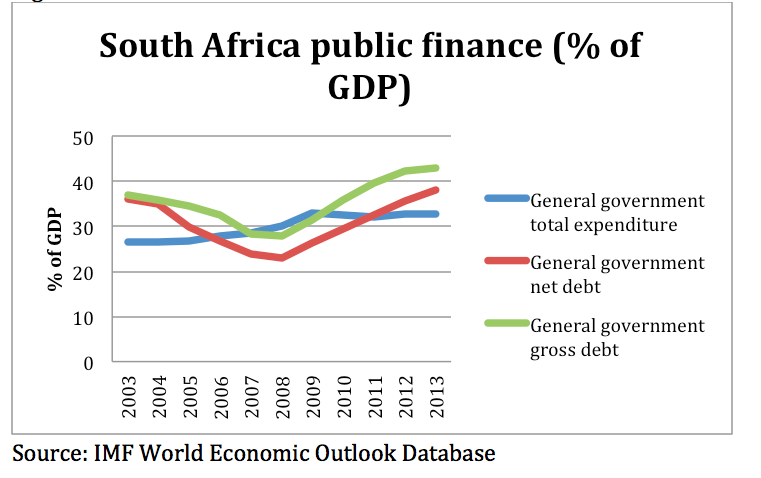 As illustrated in the graph below, since 2008 South Africa has issued debt to finance this growing welfare program. Aided by current historically low rates, the Zuma administration is relying on debt liabilities to increase welfare programs. During the Apartheid Era, White monopoly capitalists created the township. The process included evicting Black people from properties that were in areas designated as “White only”, and relocating them into urban townships. Blacks were forced to move into squalid, overcrowded and segregated townships, designed to mould the Black labour force into an orderly, submissive underclass. Streets of grim “matchbox houses” were arranged in strict grids and surrounded by a fence with only one or two points of entry, allowing the White regime’s police to seal off entire neighbourhoods with minimal effort. In such a setting, violence was both naturalised and easily-instigated for political purposes. To this day, Blacks in townships still have to contend with non-existent sanitation and electricity services, as well as rampant crime. White workers feared the large supply of African labor as the low-priced competition that it was. Hence, white tradesmen and government officials, including police, regularly harassed African workers to discourage them from traveling to the mines and competing for permanent positions. Beginning in the 1890s, the Chamber of Mines, a group of employers, complained regularly of this systematic discrimination and attempted to secure better treatment for black workers. Their gesture was neither altruistic nor founded on liberal beliefs. Indeed, the mine owners often resorted to racist measures themselves. But here they had a clear economic incentive: labor costs were minimized where rules were color-blind. This self-interest was so powerful that it led the chamber to finance the first lawsuits and political campaigns against segregationist legislation. When the National Party took power in 1948, apartheid was officially implemented in South Africa. The (Dutch) Afrikaans-dominated party ratcheted up racist laws aimed at further restricting black labor. For example, they passed the Population Registration Act and the Group Area Act in 1950, the Bantu Education Act in 1953, and other laws intended to reserve economic opportunities for whites only. In the height of the Cold War, the NP even passed a law, the Suppression of Communism Act in 1950, to gain Western support for its racists socialist policies. The xenophobic Black-on-Black violence spreading across South Africa is a direct result of centuries of White-on-Black violence and oppression. Franz Fanon, who was an expert on the psychology of colonial violence noted that the historical and current system of White-on-Black violence sends messages of Black inferiority that are so powerful that many Black people succumb to them, ultimately becoming defined by them. Internalised racism, a term first coined by Black scholar W.E.B. DuBois in 1903, involves accepting a White supremacist social order that places Black people at the bottom, and adopting society’s negative stereotypes about Blacks concerning their lack of abilities, inherent violence and low intrinsic worth. Internalised racism is a major legacy of Apartheid. South African society historically judges violence inflicted on Blacks less harshly than violence against Whites; consequently, Black people begin to believe that their own life and the lives of other Black African people are worth very little. Thereby creating the preconditions for the ongoing Afrophobic violence. If you told me in 1995 that xenophobic attacks were caused by Apartheid, I might have agreed with you. After more than twenty years of black rule in South Africa, however, that argument doesn’t ring true anymore. 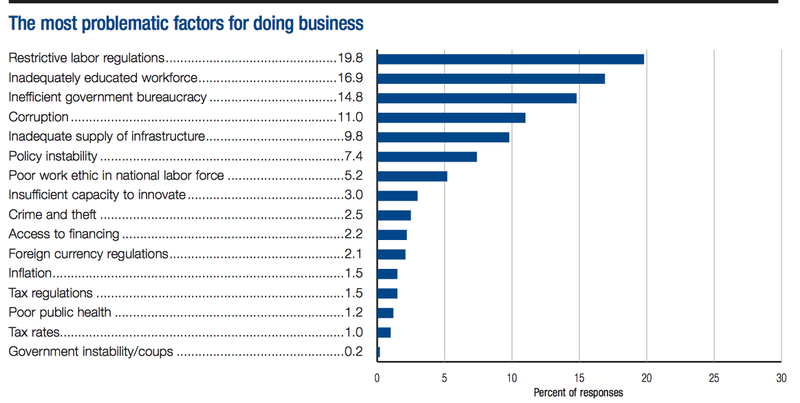 Rampant corruption, rigid labor policies, and bad economic policies are the main culprits. For instance, it is costly to hire and fire workers in South Africa. This is partly due to labor union power during the Apartheid era, and black labor unions have adopted the same restrictive rules to protect their interests. 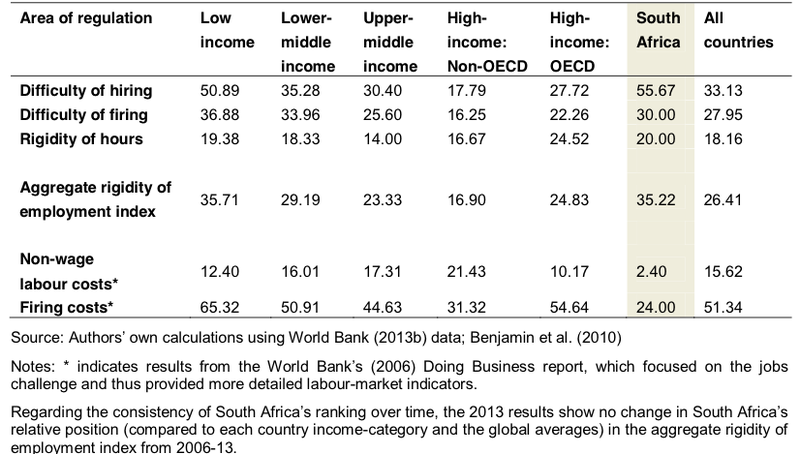 As shown in the table below from Bhorat, et al (2014), South Africa has an inflexible labor market due to various inflexible labor laws. After the South African newspaper, Sunday Times, published shocking pictures of the attack that led to the death of a Mozambican national, Emmanuel Sithole, President Zuma accused them for tarnishing the country’s image. Instead of acting to stop the violence and find real solutions to this problem, Zuma and the ANC are attacking the media for essentially doing their job. Unfortunately, he is not alone. Mr. Chengu also blames the media. “The White media focuses on the symptom rather than the disease by steering the national discourse away from broader issues of income inequality and economic democratisation, towards narrow issues of vandalism, looting and general criminality,” he stated. It is unfortunate that some are blaming the messenger and dismissing vandalism and criminality as “narrow issues”. These recent attacks on foreigners are connected to South Africa’s high crime rates. When the lives of native South Africans isn’t valued, foreigners, who are accused of stealing jobs and undercutting locals, are in big trouble. As the Los Angeles Times reported two years ago, violent crimes are on the rise in the southern Africa nation. The 2012-13 statistics released Thursday are the worst in a decade, analysts said. The figures show increases in the crimes South Africans fear most: murder; attempted murder; violent, armed house robbery; and carjacking. The rise in the murder rate was slight, at 0.6%. But the number of attempted murders rose by 6.5%, violent house robberies by 3.6% and carjackings by 5.4%. Drug-related crime rose by 13.5% and truck hijackings by nearly 15%. South Africa has some of the world’s highest rates of violent crime, with casualty figures mounting like those in a small war. The country had slowly whittled down its murder rate since 1995, but this year’s marginal increase raised fears that the battle against crime may have stalled. We can blame the media, Apartheid, and other bogeymen, but the real culprit is the ANC’s failure to create economic opportunities for its people and keep them safe. 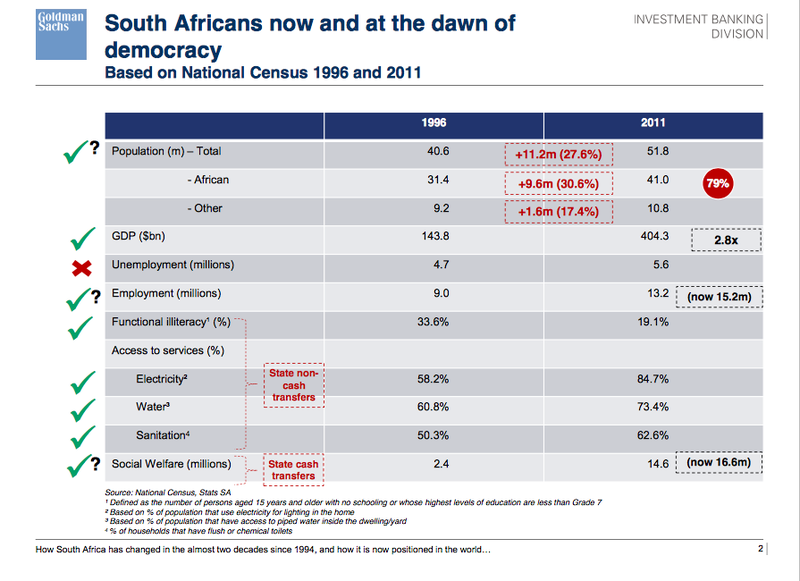 After gaining power after decades of white minority rule, the ANC liberalized the economy. However, the nation today needs further reforms to revitalized the economy. Rodrik (2006) blames high unemployment in South Africa on de-industrliazation, but it is tough to have a thriving secondary sector with low quality education and inflexible labor laws. These are changes the ANC can make to spur economic growth and create jobs for the youth. It is a stretch to blame these cowardly attacks on foreigners on White capitalists and their tight grip on the media. The main enemy of black workers in South Africa is not white capitalism, but big labor unions whether White (during Apartheid) or Black today. Given the ANC’s alliance with COSATU, a powerful trade union, and the South African Communist Party, it is highly unlikely that needed reforms will be implemented. Consequently, violence against locals and foreigners will continue as young people feel desperate. After twenty years of black majority rule, when is the ANC going to be held accountable? Yes, apartheid still has some lingering effects, but there are policies that the ANC should (have) implement to mitigate these negative impacts. There comes a time when Africans have to hold their leaders accountable. The sooner we start holding our leaders’ feet to the fire, the better South Africa and the continent will be.